Few industries have lasted so long, changed so much, suffered so many catastrophes, and grown so quickly in the last few decades. Scientific research, trial-and-error, and improving technology have been crucial to helping fish farming and other kinds of aquaculture flourish under increasing pressure. According to a report on fishing and aquaculture by the Food and Agriculture Organization of the United Nations (FAO) in 2016, “In terms of global production volume, that of farmed fish and aquatic plants combined surpassed that of capture fisheries in 2013.” For many years, it has been the fastest growing food production sector in agriculture. And digital imaging is helping it grow. The farming of aquatic animal species is not new. By 2500 BCE, the Egyptians were harvesting Tilapia from man-made ponds while the Chinese were putting carp in rice paddies to eat insects and weeds, fertilize rice, and then be served up for dinner. Both the ancient Egyptians and Greeks farmed oysters, and the Romans even installed fresh and saltwater tanks in their homes to breed eels and morays. These techniques remained largely unchanged until the late 19th century, when industrial development brought new challenges. Pollution started to put pressure on fish populations, and dams and canals obstructed the migratory paths of fish species. In response, researchers started to explore the idea of artificial breeding various fish, working to master all stages of the life cycle, from fertilization to egg storage and transportation, pond farming and releasing fish into the wild. New industrial hatcheries began appearing all over the world. In the late 1950s, the invention of artificial granulated food revolutionized fish farming. Since most species cultured in brackish and marine waters are carnivores and require fishmeal in their feed, this freed producers from their dependence on direct products from agriculture and livestock to feed the fish. By the 1970s, the development of new, lighter, more hard-wearing and less expensive building materials (fiberglass and plastic) and the use of floating cages rather than expensive glass and cast-iron saltwater ponds further increased interest in industrial-scale fish farming. 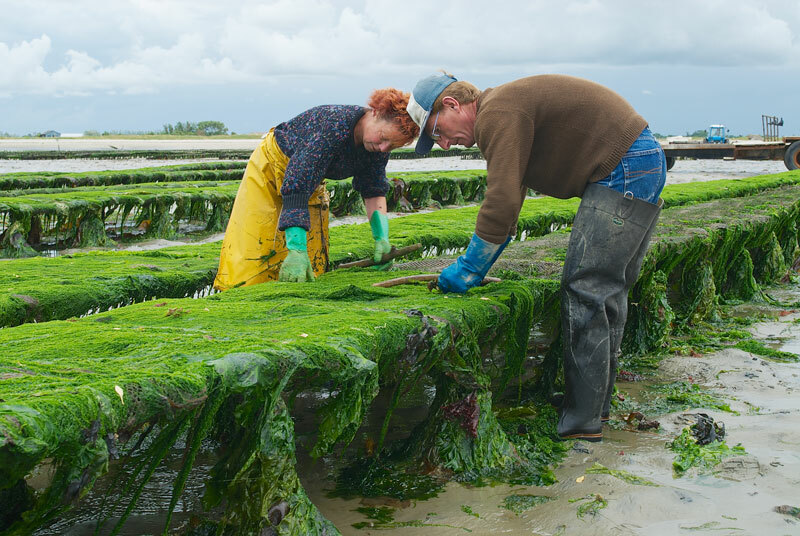 Farmers work at an oyster farm at low tide, Grandcamp-Maisy, France. The history of French oyster culture spans centuries, marked by a succession of developmental phases using different species, followed by collapses caused by diseases and reconstruction of the industry based on a different species. It turned out to be harder than expected. In the 1980s, fish farming had no precedent to lean on for ‘best practices’, which meant that entrepreneurs had to manage on a very steep learning curve through trial and error. Many of these new facilities couldn’t make it to commercial viability because of the complexities of stabilizing the marine farm environments and still optimizing production. Transmission of fish diseases is a major challenge in increasing aquaculture-based fish production. The collapse of shrimp aquaculture in the 1990s is an example of what can happen if care is not taken. Aquaculture farming has undergone significant change over the last 30 years. In its infancy, this industry was nothing more than a small group of individuals working together to carve out a niche market for the high-quality and healthy production of fish. Regardless of the difficulties they faced in making this industry viable, they succeeded. Today, fish farming reportedly generates over $230 billion annually, with farmed fish now vying with beef and poultry as the global protein of choice. In fact, more than 50% of the fish currently sold in grocery stores and served in restaurants originates from the farmed fisheries industry. For much of human history, animal husbandry involved direct relationships between farmers and their animals. However, when it comes to fish underwater, this is obviously more difficult. This becomes even more problematic when populations swell to thousands or even millions, making it almost impossible to evaluate the animals and collect information on the status of the farm population through direct observation. Farm operators need additional tools to accurately monitor and control their fish population. This concept is known as biomass control – managing the total mass of living biological organisms found in an area or ecosystem at a given time. How biomass is measured depends on why it is being measured. Within the context of fish farming, the fish biomass is the total weight of the fish outside of the water. It also considers such elements as the physical space, food, and oxygen required to sustain a given population size. Understanding biomass is critical to raising a healthy fish stock because it allows the farm operators the ability to make educated decisions regarding feeding rates, uneven growth rates, and how best to mitigate the spread of communicable disease among a site’s population. 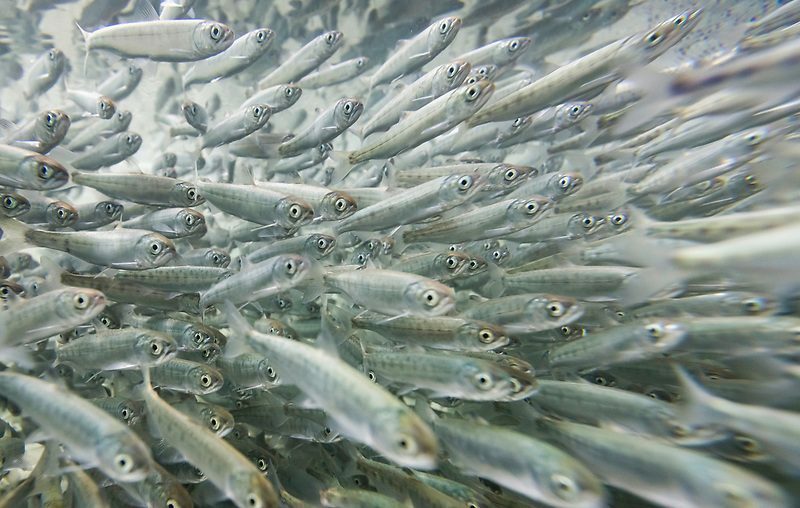 Technology has become essential for large-scale fish farms, enabling operators to monitor large populations remotely as part of day-to-day work, optimizing the growth and survival of the fish. Submerged cameras have become one of the most common tools to accomplish this. Computer vision methods can quantify several different variables on a fish farm, including movement, skin health, parasites, and behavioral changes. Managing a healthy biomass remains one of the most daunting challenges in the aquaculture farming industry. However, farmers have been able to identify the most critical juncture for biomass control in their operations. In the case of salmon fish farms, it is at the point of smolt delivery. There are several stages of fish farming. In the case of salmon, eggs are hatched in on-land, freshwater hatcheries. Once they grow to the maturity level called ‘smolt’, they are transported to an open-water site to live in cages or pens. This is where they are housed until they grow to an approximate market size of 8 – 10lbs and harvested for sale. At smolt stage, salmon are pumped from the tanks at the hatchery and into containers for transport to the site. In the beginning, aquaculture farm operators had no precise method or tools to measure or count the number of fish being introduced as a population and were forced to make educated guesses to approximate an average. Very often, these estimates were incorrect, causing significant financial loss with the mortality rate soaring. With the advent of imaging technology, the ability to accurately count the fish as they are delivered has become possible. 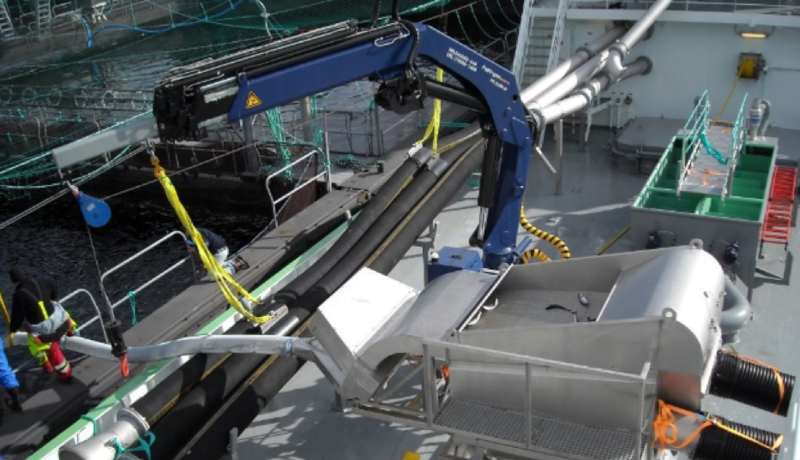 Companies such as Vaki offer solutions such as their Wellboat Smolt Counter that are designed to enable aquaculture farmers a precise level of control over a stock’s population at the time of induction to the site. The system works by utilizing line-scanning technology. As the fish pass over a light source built in the system, a silhouette image of every fish is captured. These images are analyzed and used for establishing a precise base-line population count. This machine has the capacity to scan up to 100 fish per second, stores all images digitally and are saved for future reference. Not only does this streamline production, this type of reporting offers the fish farmer highly valuable information regarding population density including weight and size distribution. This type of information is key to understanding the total biomass of a new fish population. The ability of an aquaculture farmer to attain a precise starting point for their stock population is a massive advantage when compared to the rudimentary techniques used in years past. Imaging technology has helped to open the door to success on a larger scale by giving farmers the tools necessary to monitor the biomass of their production, keeping costs low and enabling the highest yield possible. With imaging solutions becoming less expensive and more sophisticated, precision fish farming practitioners are exploring ways to incorporate machine learning and artificial intelligence to not only better analyze their farms, but enable automation to respond more quickly and safely to changing conditions.